The first thing you need to know about Mother’s Milk is that it’s called Rosalind’s Kitchen. No, not really, but that’s what’s on the window of the tiny store on Little Portland Street, which is how I managed to walk past it three times without noticing even though I was looking for it! In fairness, there’s usually a bench and A-board outside, but it was raining when I went by and they’d just been brought inside. When you do track it down, you’ll find a delightful little coffee shop with just enough room for the counter, an espresso machine and a few stools. I got told off on twitter for suggesting that it might be crowded with two customers, but I was only exaggerating ever so slightly. Yes, it really is that small. The brain-child of baristas Will and James, the focus is entirely on coffee: no cake, food, tea or hot chocolate, just coffee. Despite its size, Mother’s Milk still manages to offer the usual espresso-range and filter coffee made via the Aeropress. 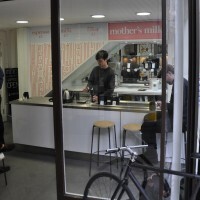 The other thing that makes it stand out is the coffee itself: Mother’s Milk is London’s only permanent outlet for JB Kaffee, a micro-roaster from Munich. September 29, 2015: This was the last day for Mother’s Milk’s in its old location. It moved a massive 80m along the street to 22-23 Little Portland Street, where it re-opened on 19th October. You can see what I made of it when I visited at the end of December. Given the trouble I had finding it, I asked co-owners Will and James why they have Rosalind’s Kitchen on the window. It turns out the owners of the lease (a cookery school which has an office above Mother’s Milk) offered a discount on the rent if it was left there. So Will and James left it there. This is somewhat symptomatic of Mother’s Milk, which is very much a labour of love. Having previously worked as baristas in the likes of Rapha Cycle Club, Espresso Room and Prufrock, Will and James begged, borrowed and pulled in favours to get up and running. In particular, Prufrock and Gwilym Davies (espresso machine) and the Espresso Room were instrumental in getting them off the ground. It’s not true to say that Mother’s Milk is a pop-up, but it does have a certain air of the temporary about it. Part of this is the lease: Will and James are subletting, an arrangement that suits them (low rent) and the landlord (space is occupied) but there’s no telling how long it will last. So, this is a roundabout way of saying that if you want to enjoy the pleasures of Mother’s Milk, best go sooner rather than later, just in case it’s moved by the time you get there! Mother’s Milk really is tiny. It occupies one side of the entrance lobby to Morley House, an office block on Little Portland Street (the other side is a cookie shop). There’s glass on two sides, making it a very bright, spacious place even though it’s small. Stepping inside, you have the counter in front of you, with the espresso machine (a delightful Lever machine by Victoria Arduino) on a separate counter to your left. There are three stools at the window-end of the main counter and, if it’s raining, the bench gets brought in and can be found behind you on the left, next to the espresso machine. Other than that, you have to stand. The main counter doubles as a brew bar and a storage/display area for the beans from JB Kaffee. Will and James are passionate about their coffee and happy to stand and chat despite a fairly constant stream of customers, quite a few of whom have offices in Morley House. Indeed, standing at the counter, watching their Aeropress technique, was a highlight for me. I tried an espresso while I was there, but while beautifully made (in a classic, hard-to-photograph black cup) it was a little too bright for me. I also had the Yirgacheffe Dumerso through the Aeropress, which was lovely. It’s exactly the sort of brightness/acidity that I dislike so much in espresso that I value so much in filter. As well as serving you coffee (with a nice pricing strategy: everything is £3), you can also buy bags of beans to take away, although you are paying a premium since it has come all the way from Munich. However, this didn’t stop a couple of customers who liked the coffee so much that they came back a few minutes later to buy a couple of bags! Before you go, I would recommend that you check out the website, if only because it is very self-effacing and funny: “serving alright espresso in an already saturated market” is an excellent tag-line! This entry was posted in Closed, Coffee Shops, West London and tagged JB Kaffee by Brian Williams. Bookmark the permalink.